Animation, by any definition, begins with a performance. This is equally true of animation’s history as it is of any individual film’s production. Especially important was the lightning cartoon or sketch, which played a vital role in the early development of what we now call animation. 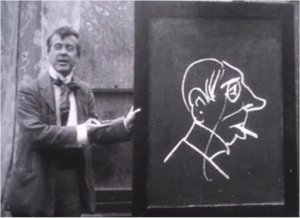 Some of the earliest appearances of drawings in moving pictures were produced by Tom Merry, whose music hall lightning cartoon act was filmed in 1895 by British film pioneers Robert Paul and Birt Acres. These films were initially displayed in Edison’s Kinetoscope, a private viewing machine, but were also shown in Paul’s earliest projected presentations in the Alhambra music hall in London’s Leicester Square in early 1896, a few months after the Lumière’s first projections which are commonly taken as the ‘birth of cinema’. Robert Paul was also instrumental in bringing stage lightning cartoonist Walter Booth to filmmaking. Initially Booth and Paul made a series of trick films, utilising Booth’s experience as a magician, but after Booth moved to Charles Urban’s film company in 1906 he produced a series of films which combined those trick techniques with his lightning cartoon act to produce ‘animated’ effects. 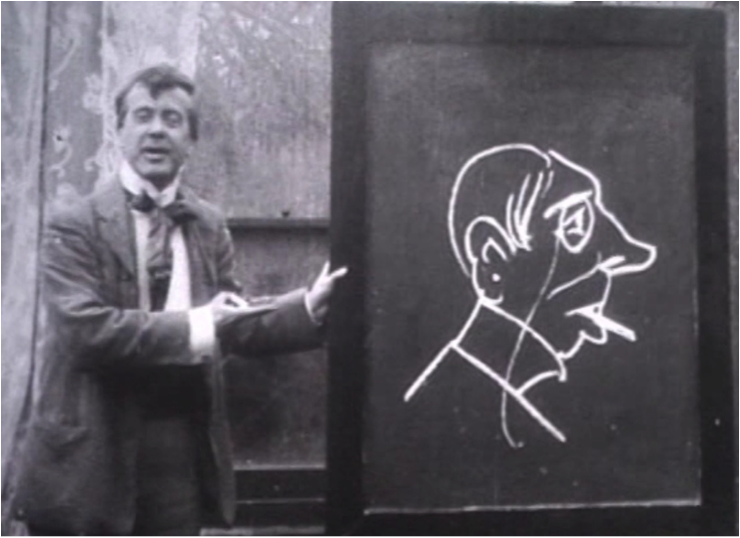 Walter Booth performing his stage act in the 1907 film ‘Comedy Cartoons’. That film was preserved and easily available and as a consequence Blackton has been hailed as ‘the father of animation’, and his work is likely familiar to readers of this blog. Booth’s films, on the other hand, were thought to have been lost and have only recently been identified in the National Film and Sound Archive in Australia and he has consequently been given little space with histories of animation. Both, however, were demonstrably working within a wider tradition of the music hall and vaudeville act. Winsor McCay also famously performed on vaudeville stages and his early animated cartoons were produced to be incorporated into those performances. Clearly the lightning cartoon performance and its international variations were central to the appearance of drawing in moving pictures and when combined with trick film techniques produced rudimentary versions of the techniques which are central to animation. Beyond simply acknowledging animation’s roots in a music hall or vaudeville performance, the lightning cartoon can also usefully shed light on the performativity of animation. As a stage performance presented directly to an audience, lightning cartoon acts may initially seem to stand in contrast to qualities we associate with animation: the stage act depending upon the immediacy of the temporally and physically co-located performer and audience, whilst animation may be characterised by its dislocation between animator and audience and the manipulation of screen time. Yet closer examination of this stage performance reveals it to have a much greater kinship with animation than simply the dynamic presentation of drawn images. The stage act was heavily constructed, most obviously by meticulous practise by the artist. The diaries of child performer Erskine Williams reveal the constant need to practise the caricatures presented, and other performers are known to have prepared drawings with barely visible lines which were traced during the performance, or revealed their images by removing a temporary whitewash. The apparent ease and immediacy with which the drawings appeared on stage was, in actual fact, underpinned by considerable preparatory effort and technical trickery. Such a situation clearly has strong affinity with animation, with its laborious construction and subsequent effortless performance on screen. That lightning cartoonists were familiar with such a dichotomy may explain why they were well suited to become the first animators. There are many other parallels between the lightning cartoon and animation, especially the use of transformation as integral to both forms, all indicating the extent to which animated cartoons were indebted to this early stage form. Examining this inheritance serves as a reminder that animation’s origins are in a performance. I am frustrated with the perfunctory treatment given by so many articles in this journal. They are at best sketches, rather than well-thought-out investigations. The subjects are fascinating, but this kind of light treatment of them is not worthy of a serious publication.